Do You Remember the One O'Clock Gun? Thread: Do You Remember the One O'Clock Gun? Does anyone remember -- or does it still occur -- the one o'clock gun? I remember the One o'clock gun Chris. We don't have it now. Thanks, Lindy. I think the one-o'clock gun came from New Brighton as I recall. Or am I dreaming???? The gun's still there. It's in between the Seacombe Mersey and Irish Ferry terminals. Thank you, Dave, for that information. Could you or someone get a pic? Does it still fire at one o'clock? I presume not based on what Lindy said but you may know better. Chris, I've got a couple of pics, but I can't find them! Grrrr! I was hoping to include them in my ealier post. I've never heard it fire. The gun is fenced off now, looks more like a momument nowadays. Deffo a subject worth googling. Chris, sorry mate, I'm losing the plot. I meant the Woodside Ferry, not Seacombe. Thanks, Dave. The gun, whether still operable or not, is definitely a monument to Liverpool and Merseyside's past. I don't know whether you noted but the site where I obtained the pic is by an Edinburgh bloke who has studied these "time guns." There were a lot of them in different cities and such a gun was essential in a port such as Liverpool to ensure that the maritime traffic ran to schedule. I remember it well. As a kid living on Park Rd in the Dingle it used to make all the windows rattle when it went off. Another great memory of living close to the river was hearing the horns all going off at midnight on New Years eve. I remember being able to hear it in Crosby as a kid. Quite a distance for sound to travel- it must have been loud! When I lived in Mossley Hill in the Sixties, I remember the squealing of goods trains being shunted each night in the railyards of Garston. Since at the same time there were a lot of reports in the popular press of UFOs, I began to think that the sounds could have been something other than what they actually were!!! when did you leave Liverpool's fair shores Chris? I first emigrated to the U.S. with my parents at age seven in 1955 but was so homesick that I was allowed by my Mom and Dad to come back and live with my grandparents in Mossley Hill. I went to Rose Lane School and Quarry Bank from 1961 to 1967, worked for Martin's Bank in Aigburth Vale and in the cash center by the Town Hall for a year then came back to the US in August 1968 on board a United States Lines container ship from Bootle... one of the last merchant ships to carry passengers I believe. Been here ever since, living in the Baltimore area. When did the 1o'clock gun last fire? I have a vague sort of memory of it, but dont know if its cos I been told about it years ago or whether I actully heard it. I am sure we heard the one-oclock gun out as far as Dovecot maybe when the wind was in the right direction. The 1 O'Clock Gun ..Last fired 18th July 1969. I've just moved to Liverpool from Washington, DC. Liverpool and Baltimore are similar, I would think, in their port city riches-to-rags-to, it appears for them both, -riches again life histories. They say people emigrate to new worlds that remind them of their old worlds. Would you say so? "Pax" as in Patuxent? Yes Baltimore has been called the Liverpool of the East Coast of America and you are right they both grew up out of nothing to become great ports and both have a big working class with a great sense of humor. Are you a Yank or a Brit, PaxCat? You could hear the One O Clock gun clealry in New Brighton, although maybe it depended on the direction of the wind, as I can't remember if we could hear it every day. Thinking of childhood sounds, I can also remember the high toned whine of what I used to think were Viscounts (but may have been another type of plane) on their approach to Speke. I would always look up at them, wondering who it could be that would be in an aeroplane, a real source of mystery and wonderment for me. What other sounds were distinctice? We used to get fog horns in winter, and of course at New Year. There is a pub on the Ford estate near Birkenhead called the One-O-Clock Gun. This isn't far from Bidston and the observatory so there is probably a connection of some sort. The One-O-Clock Gun still sounds in Edinburgh each day. I've heard it as recently as October last year. It is fired off from the castle and if you're sitting in the gardens below you don't half jump. It leaves a cloud of smoke behind. I have heard the one O Clock gun in Edinburgh, doesn't half deafen you when you are stood next to it when it's fired. 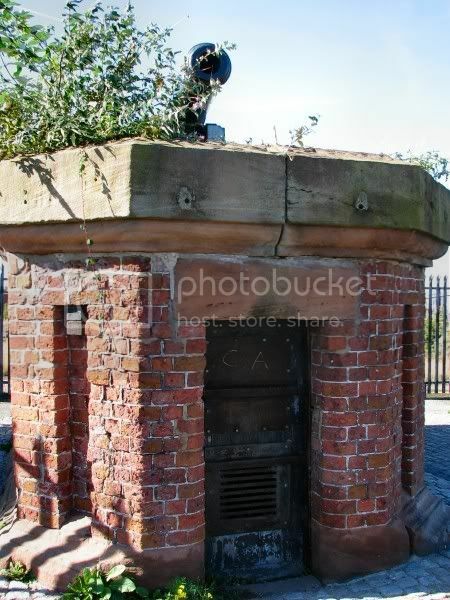 I wish Liverpool still had a one O Clock gun, I am far far too young to know about it sadly. I wonder if he'll make me crawl. I wonder how far I might fall. I'm stuck beneath my skin I don't know who to blame for this mess I'm in. Involuntarily falling to my knees another victim of heart disease. Another Night without a dark tunnel, stay in bed so I can't be stolen. And everything revolves around the fear of my fate. Everyday a little closer to death. 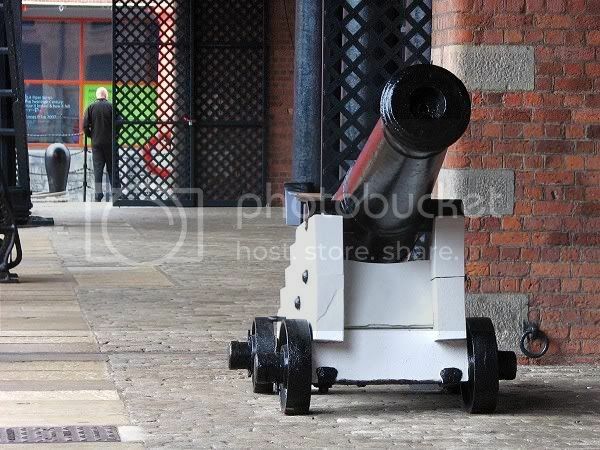 If you go to the maritime museum, and walk through to the Albert dock side, just on your right is a 32Pdr Gun used as the one O’clock gun. The image is of the plaque on the side of the gun. I did have an image of the gun but where it is now, I don’t know?? 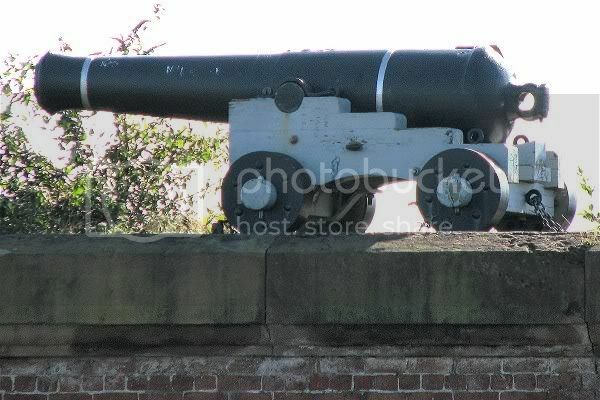 I have some info on this, The original gun was last fired in 1969 hovever the custom was revived I think in the 90s as part of the atractions for the Albert Dock. 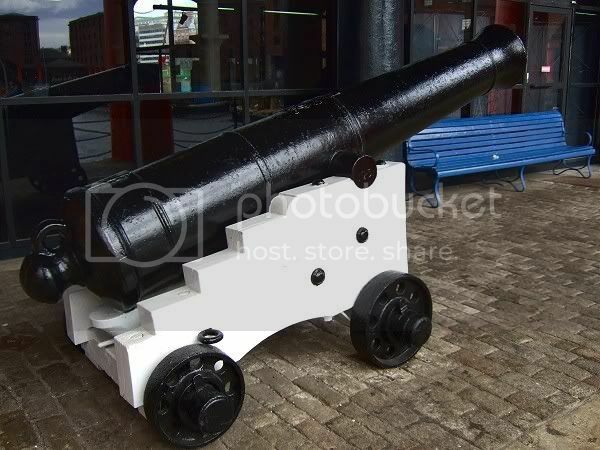 An old gun at the Albert dock had its breach remade so that it would take 12 bore. a blank 12 bore is used to fire the gun at the Albert dock every day or is it just weekends my memory fades. If you happen to be there when the gun is fired the man who fires it has a wealth of knowlege on the gun. He told me he was the last person to fire the original from the other side of the water. I remember the one o' clock gun. At the time I thought it was set off to let the people in the factories in Birkenhead know it was time to get back to work. Later, I found out that the gun was set off to allow ships in the mersey to set their chronometers. Thanks, Steven. It's kind of sad such an old tradition would go by the wayside. And thanks to drone_pilot for posting the photograph of the plaque about the gun at the Maritime Museum, that I had missed before now. Here's a couple of pics of the first One O'Clock Gun. 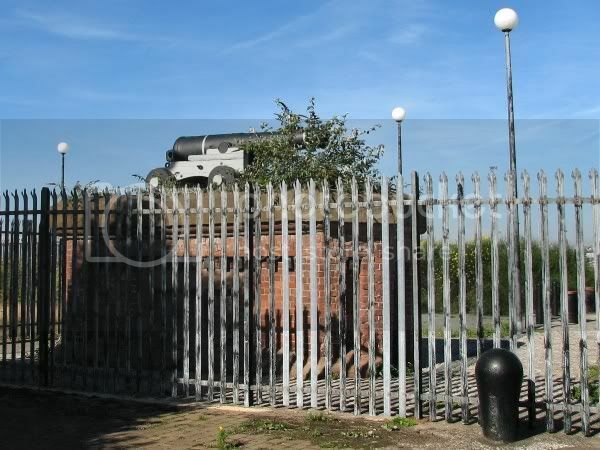 This One O'Clock Gun is located at the waterfront, at the Northern end of Morpeth Dock. It is surrounded by fencing, but when I passed, the gate was open. After travelling a little bit North, I had to move inland to avoid Twelve Quays. I think normally, you have to turn inland just before this fence and follow the edge of the Morpeth Dock.